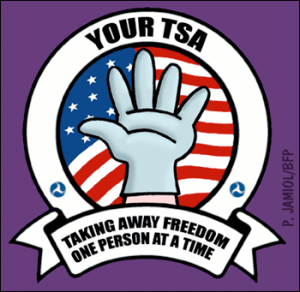 Even before you get on that plane, the Transportation Security Administration has searched your name on government and private databases. Data searched includes car registrations and employment information, according to a reported posted on the New York Times website today. The agency that routinely engages in sexual molestation at the nation’s airports says the surveillance of personal records is all about streamlining security procedures, but the effort opens a new front in the government’s effort to surveil and violate the constitutional rights of Americans not suspected of criminal behavior. The new procedure surpasses the TSA’s Secure Flight, the “behind-the-scenes program that enhances the security of domestic and international commercial air travel through the use of improved watch list matching,” according to the TSA website. Currently, details on the new initiative are murky. “It is unclear precisely what information the agency is relying upon to make these risk assessments, given the extensive range of records it can access, including tax identification number, past travel itineraries, property records, physical characteristics, and law enforcement or intelligence information,” Susan Stellin writes for the newspaper. Edward Hasbrouck, a consultant for the Identity Project, a group opposed to government prescreening initiatives, characterized the new program as a precrime effort. There is a more likely and obvious explanation, however. The initiative is part of an ongoing and escalating effort to condition the American people into passively surrendering any sense of privacy and actively eroding their resistance to a full-blown high-tech Stasi surveillance state. It is the next level of intrusion under the cover of security as the police state works to acclimate citizens to panopticon-like surveillance at all levels.